Porsche has confirmed the existence of a rally-spec Cayman prototype, with a view to producing a limited production run for customers inclined to take the rear-wheel drive sports car into competition. Known as the Cayman R-GT, it’s the combined work of Porsche works driver Romain Dumas, his engineering firm RD Ltd and Porsche itself. Dumas is also the test pilot for the project, because, you know, you can’t be breaking the Pikes Peak record every week. It seems to retain the Cayman GT4’s 911-derived 3.8-litre flat-six (and sounds absolutely epic in the video above) but will have a beefier driveline from the gearbox to the differential. The suspension will be vastly different, too, but actual details are still in the collaboration’s pockets. Perhaps we’ll learn more soon. Porsche and RD Ltd are taking the car to the German round of the WRC, where it will undergo a little competitive action and try to attract some interest from privateer racers and potential customers from all over the world. The testing we’ve seen footage of is all on asphalt, but we’d just love to see a raised version on a few gravel rounds of the championship. 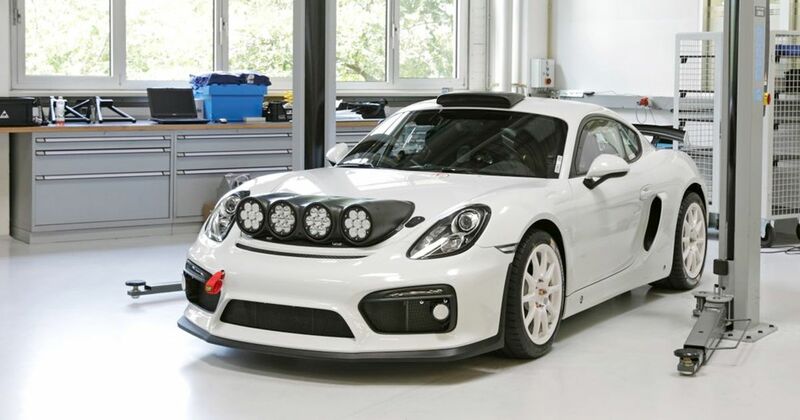 The decision whether to build a full production run rests on whether or not public response and customer demand at Rally Germany meet the necessary levels to make the car commercially viable. Either way, though: Romain, we salute you.